It’s officially December, which means Christmas will be here before we know it. This year is our first in a house–a real home with a garage and trash day and lawn service–so we thought we’d celebrate Jesus’ birth in fine style with a real Christmas tree, which is something we’ve never had. It’s been up for two days, and the floor is covered in needles. But the house smells great (as does the cat’s head). Yes, it’s a very traditional choice, I know. However, it didn’t seem fitting to have a tree without a Rudolph themed ornament on it. 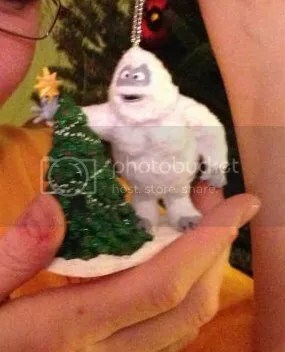 Also, it’s a tree decoration depicting something decorating a tree. It was too meta to pass up. Wayne chose to go with something a little less traditional but very much him. 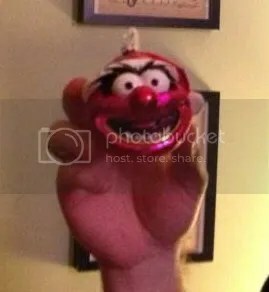 Yep, that’s Animal (his favorite Muppet) wearing a Santa hat. It’s positively festive if I do say so myself. There are also a few musical notes and instruments—mostly French horns due to the fact they’re ubiquitous at Christmas. Sadly, few people associate the trombone (or even the sackbut) with the holidays. I look forward to building our collection of tree trimmings, but there are also things my parents have that I look forward to owning one day. None more than the lovely and gracious decoration we fondly call Ho Ho. It started as a joke of sorts really, putting Ho Ho out in the house. For years, it was set above the doorway separating the den from the living room at my grandparents’ house in Arkansas. But when we moved to Florida, Ho Ho was placed in the box with essential decorations like the manger scene and precious and irreplaceable homemade ornaments. It wasn’t even a question of where it deserved to be. One of the many things I love about Christmas is that we all celebrate it, but no two families do so in exactly the same way. Last year, I wrote about Chipmunk Day, which is something I’ve always thought was fairly unique to my clan. However, there are tons of other things we look forward to. Getting new pajamas, making my dad sing “Two Turtle Doves” because it irritates the snot out of him, watching Emmet Otter’s Jug Band Christmas, eating party pizzas, reading the Christmas story from Luke, playing hearts and dominoes, my grandparents sneaking into our rooms on Christmas morning to sing and wake us up—this is the stuff that a truly joyful yuletide is made of. Other families may do totally different things to celebrate, and I’m willing to bet they look forward to their traditions as much as we do ours. Whatever you love as a family, that’s Christmas. It’s pretty safe to say that no one else in the entire world has a Ho Ho. And that’s what makes him perfect. Martha Stewart might not call him a “good thing,” but we sure do. Do you have some Christmas traditions you’re looking forward to? Do you have a “Ho Ho” of your own that’s already in a place of honor at your house? I’d love to hear about your traditions. Tell me about them in the comments section below! Ok so I looove this time of year! Even though its hot as blazes here and not feeling as Christmas-y yet! When talking about my family, honestly sentimental is not the first word I’d use. In fact its not even in the top 10 words I’d use to describe us! But we do have one thing that we have to do every year on Christmas Eve. After all of our Christmas Eve festivities of presents and yummy foods is over, we watch National Lampoon’s Christmas Vacation. This movie is probably a staple in most everyone’s household at this time of year and rightly so because its hilarious! We always laugh at the same parts and make the same comments but its something I look forward to after an evening of crazy family time. After its over, we get comfy in beds and wait for Christmas morning. Then wait a whole other year to watch it again! We have a few films we like, but that one isn’t among them. (Neither is A Christmas Story. I think we’re the only family in America that hates that movie!) We always watch Emmet Otter, White Christmas, A Christmas Carol (starring George C. Scott), and Garfield Christmas. There are others, too. A lot more in fact. Maybe we watch too many movies……NAH! 🙂 Thanks for sharing, Cathy! Ha ha! There’s no such thing as watching too many movies! We love a Garfield Christmas too!